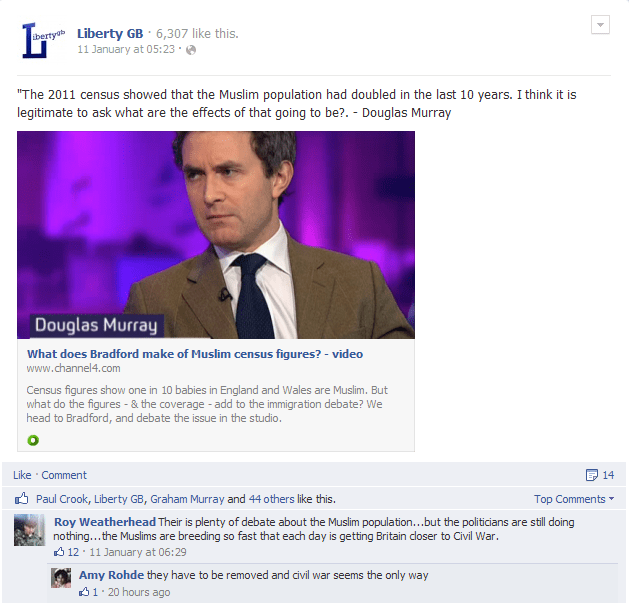 Liberty GB is a party that deviates from the traditional anti-Semitism of the far-right by promoting itself as a ‘counter Jihad’ party. 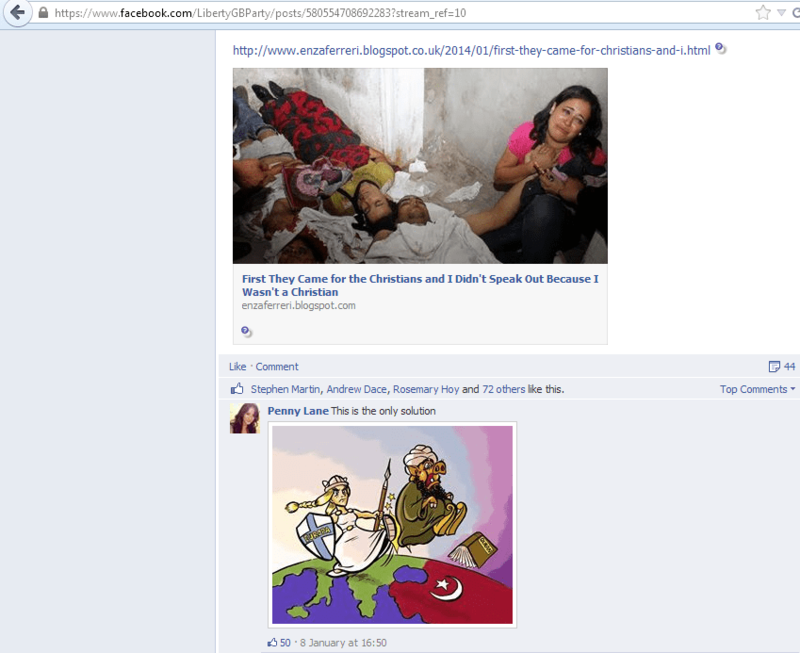 They view Islam an aggressive entity that is at war with the West. To justify this narrative, they retreat into their own constructed reality by deliberately finding stories that are intended to portray both Islam and Muslims in a negative light. For Liberty GB and their supporters, the government and other traditional liberal institutions only serve their Islamic masters. 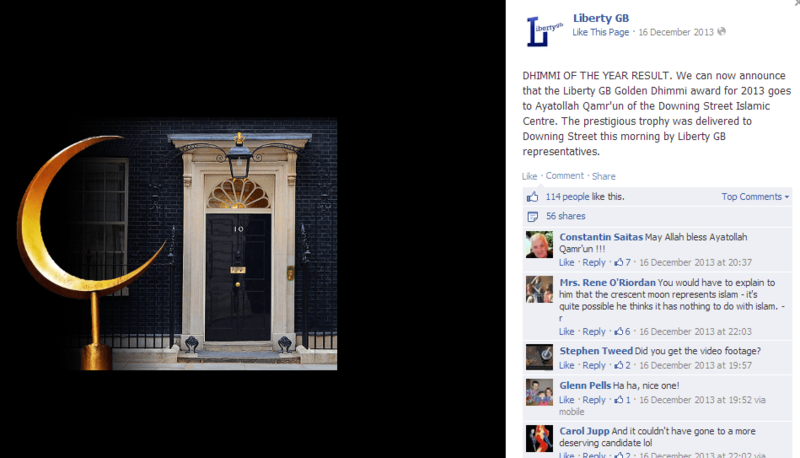 To illustrate this point, the party mockingly pretended to give David Cameron (who they called Ayatollah Qamr’un) an online ‘dhimmi’ award. If these forces go unchecked, Liberty GB and their supporters believe they will become an ethnic minority in their own country. 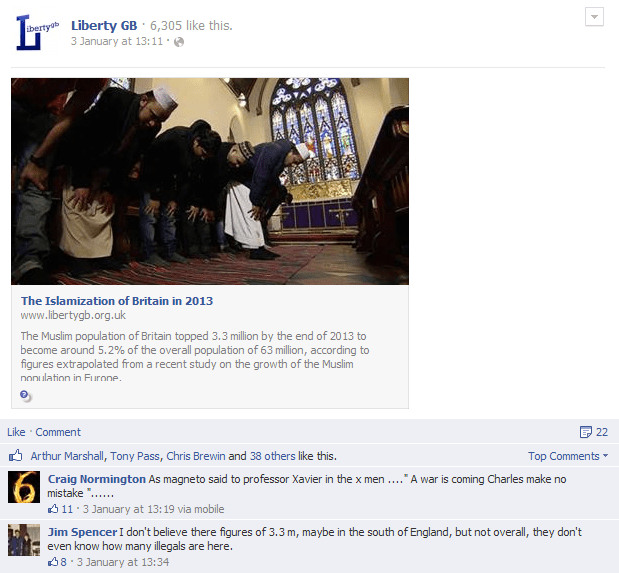 This classic far-right rhetoric is easily found to be without merit since 86 per cent of England and Wales is white. 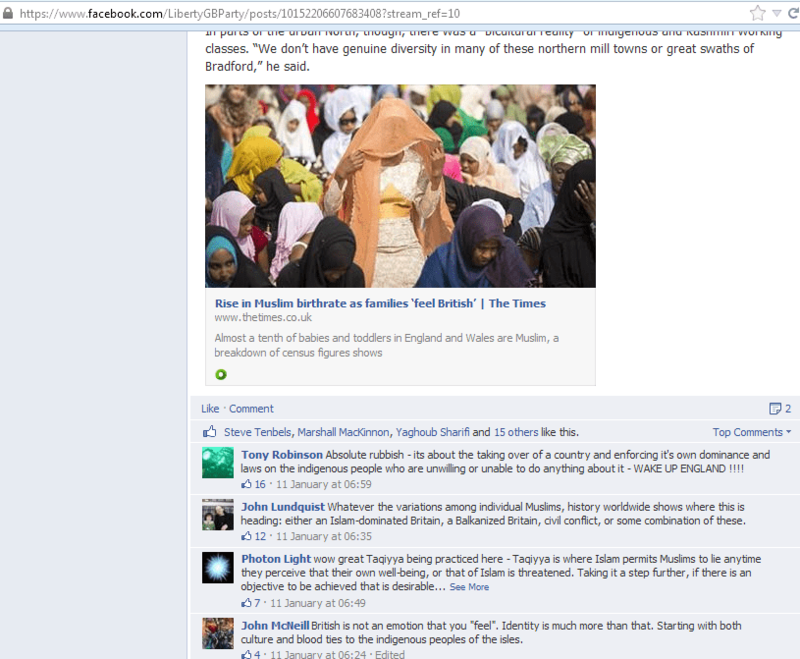 However, they are guilty of racialising Muslims. 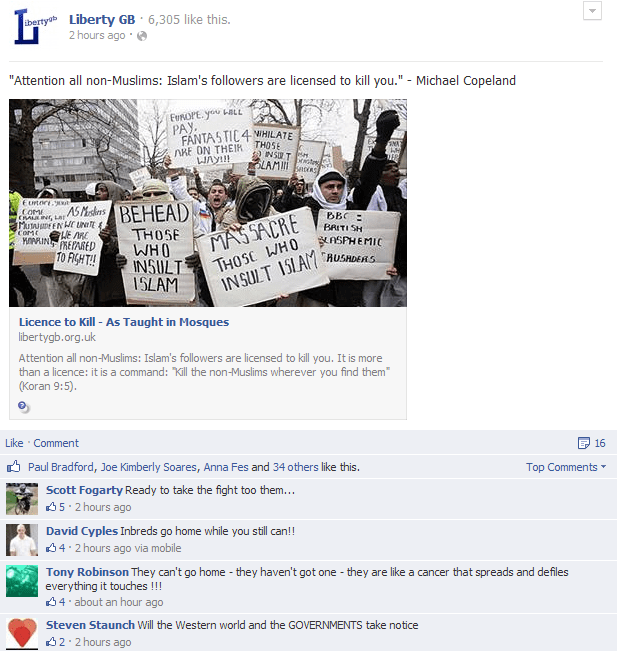 In a piece titled ‘How Should We Remove Islam From Britain and the West?’ it is stated that tighter border controls and diligent policing would have prevented ‘the terror plots and bombings, the systematised gang-rapes of underage girls, the honour killings, genital mutilations.’ This ‘othering’ of Muslims positions them as permanent outsiders and foreign to Britain. Naturally, they make no effort to explain that genital mutilation, terrorism, and honour killings are crimes they go beyond faith and cultures. Indeed, an admittance of this truth would go against their fundamentalist rhetoric. Their policies would seek to exclude Muslims from public life and promote discrimination in and out of the workplace. For example, Muslims would be unable to find employment in airports or other ‘security sensitive’ locations. Women would no longer have the option to wear a niqab or burqa. They would prevent any further mosques being built whilst stopping the adhan (call to prayer) from being played in public. 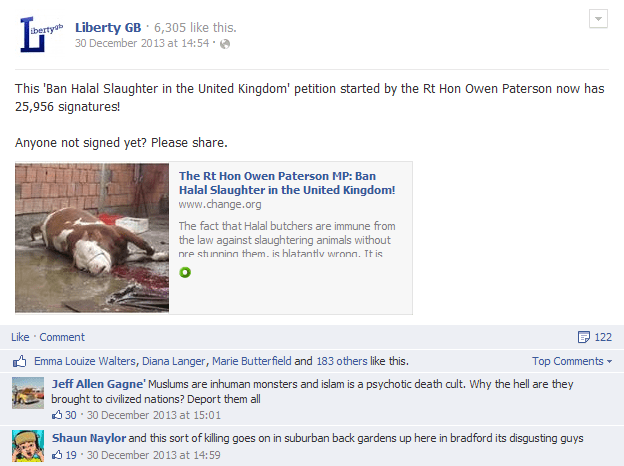 Halal slaughter and meat would also be banned (but no mention of kosher). Another disturbing policy would invoke a McCarthyite pledge of loyalty to the state. A failure to comply would be met with threats of deportation or charges of treason. 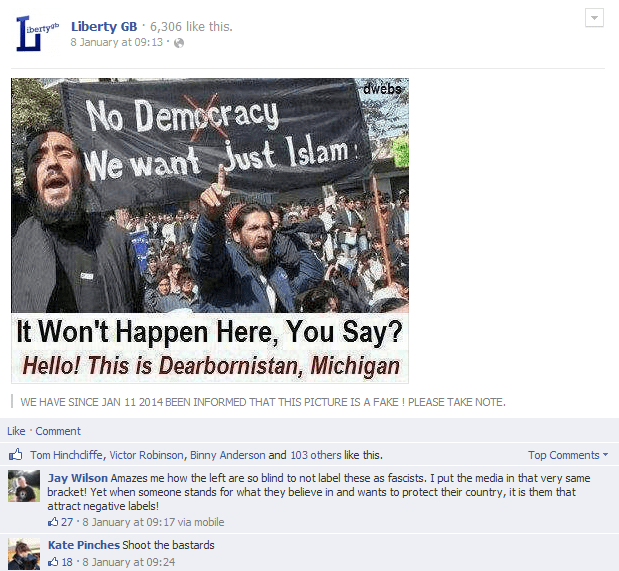 Outside of their manifesto, it is easy to find the promotion of other Islamophobic conspiracy theories like Eurabia. Their leader, Paul Weston, warns of ‘Unelected European Union leaders Islamising the entire continent.’ In a rather ironic twist, Weston claims that it is a proven fact that European Muslims take more from tax than they contribute (without offering a citation). 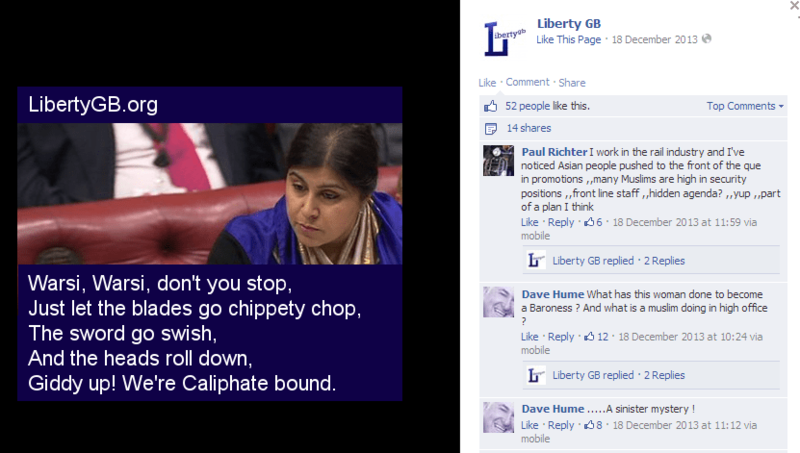 They also imply that Baroness Warsi is part of a caliphate conspiracy and they borrow a quote from New Atheist Sam Harris about being at war with Islam. 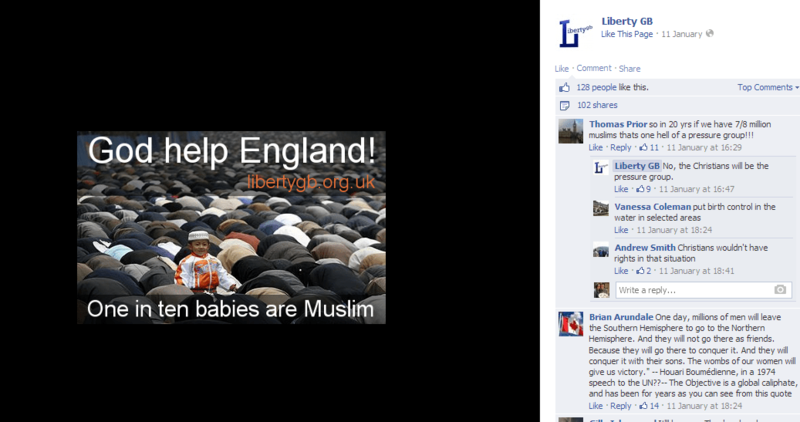 Liberty GB’s political ambitions match their racist and Islamophobic vitriol. 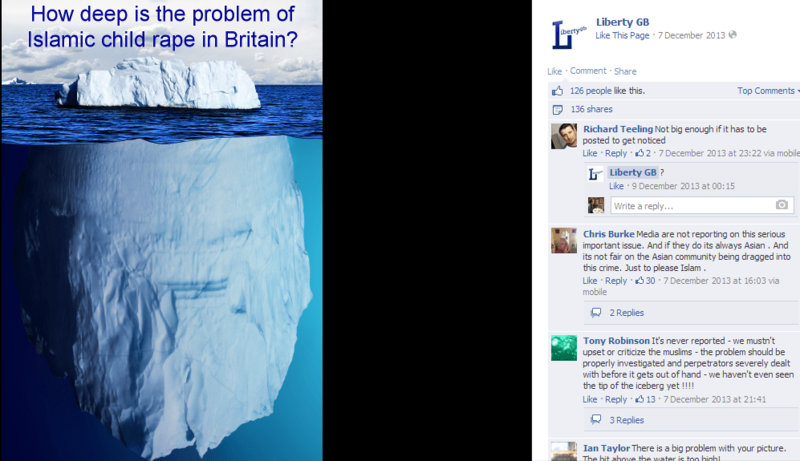 However, like many on the fringes of the British far-right, they will likely face electoral irrelevance. But in these dark corners, such groups will shout loudly about the ‘evils’ of multiculturalism, Islam and Muslims.